Come August 3, the Museum of Modern Art in New York will be the scene of "Kirchner Street Scenes, 1913–1915," featuring paintings and prints that are considered the high point of Ernst Ludwig Kirchner's career. But aficionados of German Expressionism don't have to wait for special exhibitions or be satisfied with the few works on view at major museums. Several institutions have collected one or more of these artists in depth, and some artists even have dedicated museums. Kirchner, for example, lived out his life in Davos, Switzerland, and the Kirchner Museum Davos owns more than 1,400 of his drawings, paintings, textiles, sculptures and sketchbooks. The Franz Marc Museum, in Kochel am See, near Munich, documents Marc's life and oeuvre and also exhibits works by other Blaue Reiter artists. The Die Brücke group too has an eponymous museum, in Berlin, showing art from all its members. In Munich, the Lenbachhaus owns one of the largest collections of Kandinsky, including many pieces given by the artist's onetime mistress and fellow painter, Gabriele Münter, plus a deep assemblage of works by other Blaue Reiter artists, among them Marc's Blaues Pferd ("Blue Horse") and Der Tiger ("The Tiger"). In the United States, the St. Louis Art Museum has an extensive Expressionist collection, including works by Kirchner, Nolde, Pechstein and Kandinsky. 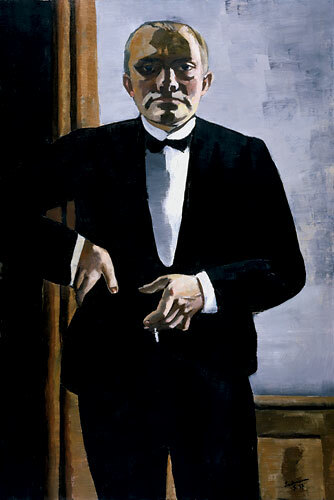 Especially well represented is Beckmann, who moved to St. Louis after World War II and whose Akrobat auf der Schaukel ("Acrobat on the Trapeze") and Selbstbildnis in blauer Jacke ("Self-portrait in Blue Jacket") are on view, along with others of his paintings. Among the Milwaukee Art Museum's extensive Expressionist holdings—which include pictures by August Macke, who died in World War I and whose pieces are hard to find—are a dozen works by Münter, the largest trove in the U.S., plus more than 450 Expressionist prints. Another institution at the top of the list is the Busch-Reisinger Museum, at Harvard University, which owns Beckmann's Selbstbildnis im Smoking ("Self-portrait in Tuxedo") and Marc's Weidende Pferde IV (Die Roten Pferde) ["Grazing Horses IV" ("The Red Horses")], along with many others. The museum will close this month for renovations, but those two paintings, plus some others from its Expressionist collection, will be on view in Harvard's Arthur M. Sackler Museum.